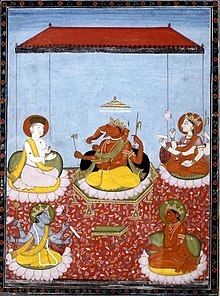 The five prime deities of Smartas in a Ganesha-centric Panchayatana: Ganesha (centre) with Shiva (top left), Devi or Durga (top right), Vishnu (bottom left) and Brahma (bottom right). 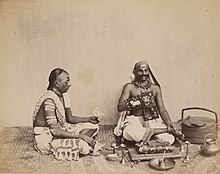 Smarta Brahmins in western India (c. 1855-1862). Smarta tradition (स्मार्त) is a movement in Hinduism that developed during its classical period around the beginning of the Common Era. It reflects a Hindu synthesis of four philosophical strands: Mimamsa, Advaita, Yoga, and theism. The Smarta tradition rejects theistic sectarianism, and it is notable for the domestic worship of five shrines with five deities, all treated as equal – Vishnu, Shiva, Brahma, Ganesha and Devi (Shakti). The Smarta tradition contrasted with the older Shrauta tradition, which was based on elaborate rituals and rites. There has been considerable overlap in the ideas and practices of the Smarta tradition with other significant historic movements within Hinduism, namely Shaivism, Brahmanism, Vaishnavism, and Shaktism. The Smarta tradition is aligned with Advaita Vedanta, and regards Adi Shankara as its founder or reformer. Shankara championed the ultimate reality is impersonal and Nirguna (attributeless) and any symbolic god serves the same equivalent purpose. Inspired by this belief, the Smarta tradition followers, along with the five Hindu gods include a sixth impersonal god in their practice. The tradition has been called by William Jackson as "advaitin, monistic in its outlook". The term Smarta also refers to Brahmins who specialize in the Smriti corpus of texts named the Grihya Sutras, in contrast to Shrauta Sutras. Smarta Brahmins with their focus on the Smriti corpus, contrast from Srauta Brahmins who specialize in the Sruti corpus, that is rituals and ceremonies that follow the Vedas. Smarta स्मार्त is an adjective derived from Smriti (Sanskrit: स्मृति, Smṛti, IPA: [s̪mr̩.t̪i] ?). The smriti are a specific body of Hindu texts usually attributed to an author, traditionally written down but constantly revised, in contrast to Śrutis (the Vedic literature) considered authorless, that were transmitted verbally across the generations and fixed. In Smarta tradition context, the term Smarta means "follower of Smriti". Smarta is specially associated with a "sect founded by Shankaracharya", states Monier Williams. The Vedanga texts, states Alf Hiltebeitel, are Smriti texts that were composed in the second half of the Vedic period that ended around 500 BCE. The Vedanga texts include the Kalpa (Vedanga) texts consisting of the Srautasutras, Grihyasutras and Dharmasutras, many of which were revised well past the Vedic period. The Grihyasutras and Dharmasutras, states Hiltebeitel, were composed between 600 BCE and 400 CE, and these are sometimes called the Smartasutras, the roots of the Smriti tradition. The Smriti texts accept the knowledge in the Sruti (Vedas), but they interpret it in a number of ways, which gave rise to six darsanas (orthodox schools) of Hindu philosophy. Of these, states Hiltebeitel, the Mimamsa and Vedanta have sometimes been called the Smarta schools which emphasize the Vedas with reason and other pramanas, in contrast to Haituka schools which emphasize hetu (cause, reason) independent of the Vedas while accepting the authority of the Vedas. Of the two Smarta traditions, Mimamsa focussed on Vedic ritual traditions, while Vedanta focussed on Upanishadic knowledge tradition. Around the start of the common era, and thereafter, a syncretism of Haituka schools (Nyaya, Vaisheshika, Samkhya and Yoga), the Smarta schools (Mimamsa, Vedanta) with ancient theistic ideas (bhakti, tantric) gave rise to a growth in traditions such as Shaivism, Vaishnavism and Shaktism. Hiltebeitel and Flood locate the origins of a revived orthodox Smarta Tradition in the (early) Classical Period of Hinduism, particularly with nondualist (Advaita) interpretation of Vedanta, around the time when different Hindu traditions emerged from the interaction between Brahmanism and local traditions. The revived Smarta Tradition attempted to integrate varied and conflicting devotional practices, with its ideas of nondual experience of Atman (self, soul) as Brahman. The rapprochement included the practice of pancayatana-puja (five shrine worship), wherein a Hindu could focus on any saguna deity of choice (istadevata) such as Vishnu, Shiva, Durga, Surya or Ganesha, as an interim step towards realizing the nirguna Brahman. The growth of this Smarta Tradition began in the Gupta period (4th-5th century CE), and likely was dominated by Dvija classes, in particular the Brahmins, of the early medieval Indian society. This Smarta Tradition competed with other major traditions of Hinduism such as Shaivism, Vaishnavism, and Shaktism. The ideas of Smarta Tradition were historically influential, creative with concepts such as of Harihara (half Shiva, half Vishnu deity) and Ardhanarishvara (half woman, half man deity), and many of the major scholars of Shaivism, Vaishnavism, Shaktism and Bhakti movement came out of the Smarta Tradition. Medieval era scholars such as Vedanta Desika and Vallabhacharya recognized Smarta Tradition as competing with Vaishnavism and other traditions. According to Jeffrey Timm, for example, in verse 10 of the Tattvarthadipanibandha, Vallabhacharya states that, "Mutually contradictory conclusions are non-contradictory when they are considered from their respective contexts, like Vaishnava, Smarta, etc." According to Murray Milner Jr., a professor of Sociology, the Smarta tradition refers to "Hindus who tend toward Brahmanical orthodoxy in both thought and behavior". Smartas are usually committed to a "relatively unified Hinduism" and they reject extreme forms of sectarian isolationism, reminiscent of the European discourse about church and Christian sects. The tradition, states Milner, has roots that emerged sometime between 3rd century BCE and 3rd century CE, likely in response to the growth of Jainism and Buddhism. It reflected a Hindu synthesis of four philosophical strands: Mimamsa, Advaita, Yoga and theism. Smarta tradition emerged initially as a synthesis movement to unify Hinduism into a nonsectarian form based on the Vedic heritage. It accepted varnasrama-dharma, states Bruce Sullivan, which reflected an acceptance of Varna (caste/class) and ashrama (four stages of human life) as a form of social and religious duty. In the later second half of the 1st millennium, Adi Shankara reformed and brought ideas to the movement in the form of the Advaita Vedanta philosophy. According to Upinder Singh, the Smarta tradition's religious practice emerged as a transformation of Brahmanism and can be described as Hinduism. Smarta as a tradition emphasized all gods as equal and different ways of perceiving the all-pervasive metaphysical impersonal Brahman. The adjective Smārta is also used to classify a Brahmin who adheres to the Smriti corpus of texts. Smarta Brahmins specialize in the Smriti corpus of texts, are differentiated from Srauta Brahmins who specialize in the Sruti corpus of texts such as the Brahmanas layer embedded inside the Vedas. Smarta Brahmins are also differentiated from Brahmins who specialize in the Agamic (non-Vedic, Tantra) literature such as the Adi Shaiva Brahmins, Sri Vaishnava Brahmins and Shaiva Kashmiri Pandits. However, these identities are not clearly defined, and active groups such as "Agamic Smarta Saiva Brahmins" have thrived. Visvakarmas are artisans found in South India, such as in the state of Karnataka. They are known for their traditional expertise and skills as blacksmiths, carpenters, coppersmiths, sculptors and goldsmiths. Smarta Visvakarmas are vegetarian artisans who follow the Smarta tradition. They contrast with Vaishnava Visvakarmas who follow the Vaishnavism tradition of Hinduism and some of whom may consume non-vegetarian food. The re-marriage of widows is a tradition found among the Smarta Visvakarmas, but has been atypical among Vaishnava Visvakarma. According to Brouwer, examples of Smarta Visvakarmas include Niligundapanta (traditionally blacksmiths and carpenters), Konnurpanta (all five artisan trades) and Madipattar (goldsmiths). The Smarta Visvakarmas are not considered to be Brahmins. According to Smartism, supreme reality, Brahman, transcends all of the various forms of personal deity. [note 1] The Smartas follow an orthodox Hindu philosophy, which means they accept the Vedas, and the ontological concepts of Atman and Brahman therein. The Smarta Tradition accepts two concepts of Brahman, which are the saguna Brahman – the Brahman with attributes, and nirguna Brahman – the Brahman without attributes. The nirguna Brahman is the unchanging Reality, however, the saguna Brahman is posited as a means to realizing this nirguna Brahman. The concept of the saguna Brahman is considered in this tradition to be a useful symbolism and means for those who are still on their spiritual journey, but the saguna concept is abandoned by the fully enlightened once he or she realizes the identity of their own soul with that of the nirguna Brahman. A Smarta may choose any saguna deity (istadevata) such as Vishnu, Shiva, Durga, Surya, Ganesha or any other, and this is viewed in Smarta Tradition as an interim step towards realizing the nirguna Brahman and its equivalence to one's own Atman. The Smartas evolved a kind of worship which is known as Panchayatana puja. In this Puja, one or more of the five Hindu Deities (Surya, Shiva, Vishnu, Ganesha and Devi or Shakti) are the objects of veneration. The five symbols of the major Gods are placed on a round open metal dish called Panchayatana, the symbol of the deity preferred by the worshiper being in the center. A similar arrangement is also seen in the medieval temples, in which the central shrine housing the principal Deity is surrounded by four smaller shrines containing the figures of the other deities. Some of the Smartas of South India add a sixth god Kartikeya (See Shanmata). According to Basham, "[m]any upper-class Hindus still prefer the way of the Smartas to Saiva and Vaisnava forms of worship". Practically, Adi Shankara Acharya fostered a rapprochement between Advaita and smarta orthodoxy, which by his time had not only continued to defend the varnasramadharma theory as defining the path of karman, but had developed the practice of pancayatanapuja ("five-shrine worship") as a solution to varied and conflicting devotional practices. Thus one could worship any one of five deities (Vishnu, Siva, Durga, Surya, Ganesa) as one's istadevata ("deity of choice"). Smartas follow the Hindu scriptures. Like all traditions within Hinduism, they accept as an epistemic premise that Śruti (Vedic literature) is a reliable source of knowledge. The Śruti includes the four Vedas including its four layers of embedded texts - the Samhitas, the Brahmanas, the Aranyakas and the early Upanishads. Of these, the Upanishads are the most referred to texts. The identity of Atman and Brahman, and their unchanging, eternal nature, are the basic truths in this tradition. The emphasis in Vedic texts here is the jnana-kanda (knowledge, philosophical speculations) in the Upanishadic part of the Vedas, not its karma-kanda (ritual injunctions). Along with the Upanishads, the Bhagavad Gita and Brahma Sutras are the central texts of the Advaita Vedanta tradition, providing the truths about the identity of Atman and Brahman and their changeless nature. The Brahmasutra is considered as the Nyaya Prasthana (canonical base for reasoning). The Bhagavad Gita is considered as the Smriti Prasthana. The text relies on other Smritis, such as the Vedangas, Itihasa, Dharmasastras, Puranas and others. Some of this smriti literature incorporated shramanic and Buddhist influences of the period from about 200 BC to about AD 300  and the emerging bhakti tradition into the Brahmanical fold. The Vidyashankara temple at Sringeri Sharada Peetham, Sringeri, Karnataka, a historic center of the Smarta Tradition. The Smarta Tradition includes temples and monasteries. More Smarta temples are found in West and South India, than in North India. Adi Shankara is one of the leading scholars of the Smarta Tradition, and he founded some of the most famous monasteries in Hinduism. These have hosted the Daśanāmi Sampradāya under four Maṭhas, with the headquarters at Dwarka in the West, Jagannatha Puri in the East, Sringeri in the South and Badrinath in the North. Each math was headed by one of his disciples, called Shankaracharya, who each independently continued the Advaita Vedanta Sampradaya. The ten Shankara-linked Advaita monastic orders are distributed as follows: Bharati, Puri and Saraswati at Sringeri, Aranya and Vana at Puri, Tirtha and Ashrama at Dwarka, and Giri, Parvata and Sagara at Badrinath. The mathas which Shankara built exist until today, and continue the teachings and influence of Shankara. The table below gives an overview of the four largest Advaita Mathas founded by Adi Shankara, and their details. [web 1] However, evidence suggests that Shankara established more mathas locally for Vedanta studies and its propagation, states Hartmut Scharfe, such as the "four mathas in the city of Trichur alone, that were headed by Trotaka, Sureshvara, Hastamalaka and Padmapada". 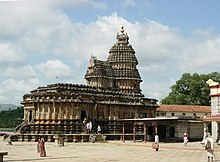 The Sringeri Sharada monastery founded by Jagatguru Sri Adi Shankaracharya in Karnataka is the centre of the Smarta sect. The emerging pan-Indian nationalism was clearly founded upon a number of cultural movements that, for the most part, reimagined an 'Aryo-centric', neo-brahmanical vision of India, which provided the 'ideology' for this hegemonic project. In the Tamil region, such a vision and ideology was closely associated with the Tamil Brahmans and, especially, the Smarta Brahmans who were considered the strongest adherents of the pan-Indian Sanskrit-Brahmanical tradition. ^ By contrast, the dualistic Vaishnava traditions consider Vishnu or Krishna to be the supreme God who grants salvation. Similarly, the dualistic subtradition of Shaiva Siddhanta holds the same beliefs about Shiva. Other traditions of Shaivism, Vaishnavism, Shaktism hold a spectrum of beliefs between dualism and nondualism. ^ Shankara himself, and his influential predecessor Gaudapada, used Buddhist terminology and mention Buddhist doctrines in their work, suggesting that they were influenced by Buddhism. Gaudapada, states Raju took over the Buddhist doctrines that ultimate reality is pure consciousness (vijñapti-mātra) and "that the nature of the world is the four-cornered negation", then "wove [both doctrines] into a philosophy of the Mandukaya Upanisad, which was further developed by Shankara". In Gaudapada's text, similarly, the Buddhist concept of "ajāta" from Nagarjuna's Madhyamaka philosophy is found. In contrast, other scholars such as Murti, assert that while there is borrowed terminology, Gaudapada's doctrines are unlike Buddhism. Gaudapada's influential text consists of four chapters; Chapter One, Two and Three of which are entirely Vedantin and founded on the Upanishads, with little Buddhist flavor. Chapter Four uses Buddhist terminology and incorporates Buddhist doctrines, state both Murti and Richard King, but Vedanta scholars who followed Gaudapada through the 17th century never referenced nor used Chapter Four, they only quote from the first three. The Gaudapada tradition is Vedantin with its foundation of Atman and Brahman, and his doctrines fundamentally different from Buddhism which deny these foundational concepts of Hinduism. ^ a b c d e Milner, M. (1994). Status and Sacredness: A General Theory of Status Relations and an Analysis of Indian Culture. Oxford University Press. pp. 194–195. ISBN 978-0-19-535912-1. Retrieved 18 June 2018. ^ a b c Flood 1996, p. 113. ^ Knipe 2015, pp. 36-37. ^ Flood 1996, p. 113, 134, 155-161, 167-168. ^ a b Sanderson, Alexis. "The Saiva Age: The Rise and Dominance of Saivism during the Early Medieval Period." In: Genesis and Development of Tantrism, edited by Shingo Einoo. Tokyo: Institute of Oriental Culture, University of Tokyo, 2009. Institute of Oriental Culture Special Series, 23, pp. 276-277. ^ Knipe 2015, p. 36. Buhnemann, Gudrun, Mandalas and Yantras in the Hindu Traditions, Leiden, Brill, 2003. pg. 57. "Initially a brief explanation of the word Smārta may be in order. Smārta is a rather loosely used term which refers to a Brahmin who is an ‘adherent of the Smrti’ and of the tradition which is ‘based on the Smrti.’"
^ a b Flood, Gavin (1996), An Introduction to Hinduism, Cambridge University Press. pg. 17. "There is also an important tradition of Brahmans called Smārtas, those who follow the smrti or secondary revelation..." pg.56. "The Brahmans who followed the teachings of these texts were known as Smārtas, those who followed the smrtis..." pg.113. "The Brahmans who followed the puranic religion became known as smārta, those whose worship was based on the Smrtis, or pauranika, those based on the Purānas." ^ a b Gavin Flood (2006). The Tantric Body: The Secret Tradition of Hindu Religion. I.B.Tauris. pp. 6–7. ISBN 978-1-84511-011-6. ^ a b c d e Doniger 1999, p. 1017. ^ a b Monier Monier-Williams (1923). A Sanskrit-English Dictionary. Oxford University Press. p. 1154. ^ Hiltebeitel 2013, p. 13. ^ a b Hiltebeitel 2013, pp. 13-14. ^ a b Hiltebeitel 2013, pp. 18-19. ^ Mircea Eliade; Charles J. Adams (1987). The encyclopedia of religion. 6. Macmillan. pp. 345–347. ISBN 978-0-02-909750-2. ^ Hiltebeitel 2013, pp. 18-22. ^ Hiltebeitel 2013, pp. 18-22, 29-30. ^ a b c d Hiltebeitel 2013, pp. 29-30. ^ Smarta sect, Encyclopædia Britannica (2012), Quote: "Smarta sect, orthodox Hindu sect composed of members of the “twice-born,” or initiated upper classes (Brahmin, Kshatriya, and Vaishya), whose primarily Brahmin followers (...)." ^ a b c William Joseph Jackson (1994). Tyāgarāja and the Renewal of Tradition: Translations and Reflections. Motilal Banarsidass. pp. 212–220. ISBN 978-81-208-1146-1. ^ Jeffrey R. Timm (1992). Texts in Context: Traditional Hermeneutics in South Asia. State University of New York Press. p. 138. ISBN 978-0-7914-0796-7. ^ Sullivan, B.M. (1997). Historical Dictionary of Hinduism. Historical dictionaries of religions, philosophies, and movements. Scarecrow Press. pp. 213–214. ISBN 978-0-8108-3327-2. ^ Singh, U. (2008). A History of Ancient and Early Medieval India: From the Stone Age to the 12th Century. Pearson Education. pp. 509–514. ISBN 978-81-317-1120-0. ^ Melton, J.G. (2014). Faiths Across Time: 5,000 Years of Religious History. ABC-CLIO. p. 578. ISBN 978-1-61069-026-3. ^ Buhnemann, Gudrun, Mandalas and Yantras in the Hindu Traditions, Leiden, Brill, 2003. pg. 57. "Initially a brief explanation of the word Smārta may be in order. Smārta is a rather loosely used term which refers to a Brahmin who is an ‘adherent of the Smrti’ and of the tradition which is ‘based on the Smrti.’"
^ Flood 1996, pp. 56-57. ^ Gavin Flood (2006). The Tantric Body: The Secret Tradition of Hindu Religion. I.B.Tauris. pp. 7–8. ISBN 978-1-84511-011-6. ^ Fred W. Clothey (2006). Ritualizing on the Boundaries: Continuity and Innovation in the Tamil Diaspora. University of South Carolina Press. pp. 168–169. ISBN 978-1-57003-647-7. ^ a b c J. Brouwer (1987). Rob de Ridder (ed.). The Leiden Tradition in Structural Anthropology: Essays in Honour of P.E. de Josselin de Jong. Jan A. J. Karremans. Brill Academic. pp. 161–162. ISBN 978-90-04-08517-6. ^ a b Burton Stein; Sanjay Subrahmanyam (1996). Institutions and economic change in South Asia. Oxford University Press. pp. 257–258. ISBN 978-0-19-563857-8. ^ Espin & Nickoloff 2007, p. 563. ^ Basham 1991, p. 109. ^ a b Raju 1971, p. 177-178. ^ Raju 1971, p. 177. ^ Potter 1981, p. 81. ^ Deutsch 1988, pp. 4-6 with footnote 4. ^ a b Koller 2013, p. 100-101. ^ Isaeva 1993, p. 35. ^ a b Isaeva 1993, p. 35-36. ^ a b c Larson 2009, p. 185. ^ a b c Constance Jones; James D. Ryan (2006). Encyclopedia of Hinduism. Infobase. p. 280. ISBN 978-0-8160-7564-5. ^ a b Karel Werner (2013). Love Divine. Routledge. pp. 148–151. ISBN 978-1-136-77461-4. ^ Gerald James Larson (1995). India's Agony Over Religion. State University of New York Press. pp. 99–100. ISBN 978-1-4384-1014-2. ^ Vasudha Narayanan (2009). Hinduism. The Rosen Publishing Group. pp. 50–51. ISBN 978-1-4358-5620-2. ^ Nakamura, Hajime (2004). A History of Early Vedanta Philosophy. Part Two (Original: 1950). Motilal Banarsidass. pp. 680–681. ISBN 978-8120819634. ^ Kamat, Suryakant (1984). Karnataka State gazetteer. 3. Gazetter Dept. p. 106. ^ Vaitheespara 2010, p. 91. ^ "Adi Shankara's four Amnaya Peethams". Archived from the original on 26 June 2006. Retrieved 20 August 2006. Wikimedia Commons has media related to Smarta Tradition.